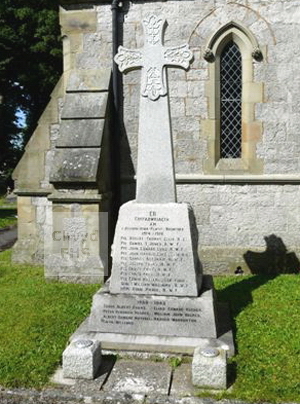 The Brynford War Memorial commemorates those men of the area who died in the First and Second World Wars. The memorial stands in the grounds of St. Michaelâ€™s Church and was dedicated on 2 February 1921. Brynford (Welsh: Brynffordd) is a village and community near the town of Holywell in Flintshire. Between 1974 and 1996, it was in the county of Clwyd. ("P" Special Coy.) 7 May 1917 21 Son of Thomas & Sarah Ellis, of 10, Neston View, Bagillt. Grevillers British Cemetery, Pas de Calais, France. Holywell St. Michael's Churchyard, Brynford. ("C" Coy. 17th Bn.) 28 Aug 1917 37 Husband of Grace Luke, of The Bungalow, Holywell. Tyne Cot Memorial, West-Vlaanderen, Belgium. (1st/5th Bn.) 8 Feb 1919 20 Son of Harriett Luke, of Derwen Bach House, Milwr, & the late Joseph Luke. St. Michael's Churchyard, Brynford. (19th Bn.) 28 Sep 1917 Rocquigny-Equancourt Road British Cemetery, Manancourt, Somme, France. Evan Royal Welsh Fusiliers 1925 34 Born Northop. Son of John & Mary Pierce, Penrhywlfa, Brynford. Died in Holywell. (5th Bn.) 29 Aug 1915 23 Son of Ann Price, of Eosfan House, Brynford & the late Robert Price. Helles Memorial, Turkey. (13th Bn.) 22 Apr 1916 24 Son of William and Elizabeth Price, of Brynford, Holywell, Flints. Also named on the Connah's Quay and Shotton and Hawarden War Memorials. Merville Communal Cemetery, Nord, France. Brynford St. Michael's Churchyard, Brynford. 1081239 Royal Air Force Volunteer Reserve 7 Dec 1942 21 Chittagong War Cemetery, Bangladesh. (1st Bn.) 23 Jun 1944 29 Taukkyan War Cemetery, Burma. (2nd Bn.) 29 Oct 1944 21 Son of Edward Owen Hughes & Frances Hughes, of Milwr, Flintshire. Also commemorated on the Flint War Memorial. Taukkyan War Cemetery, Burma. (1st Bn. ) Apr 1943 24 Rangoon Memorial, Burma. (68 H.A.A. Regt., R.A., Sig. Sec.) 1942 23 Alamein Memorial, Egypt.